I was not an athletic kid. Team sports gave me anxiety and gym class, to me, was more a necessary evil than a good time. Oh, with the exception of that one month in grade 10 when we did ballroom dancing! That was fun. Looking back I wish that I had been given the opportunity to take dance. I’m pretty sure that would’ve been my jam! One of the things I love about Pilates is the graceful, dance based movement of many of the exercises. I wrote about that here, in case you missed it. 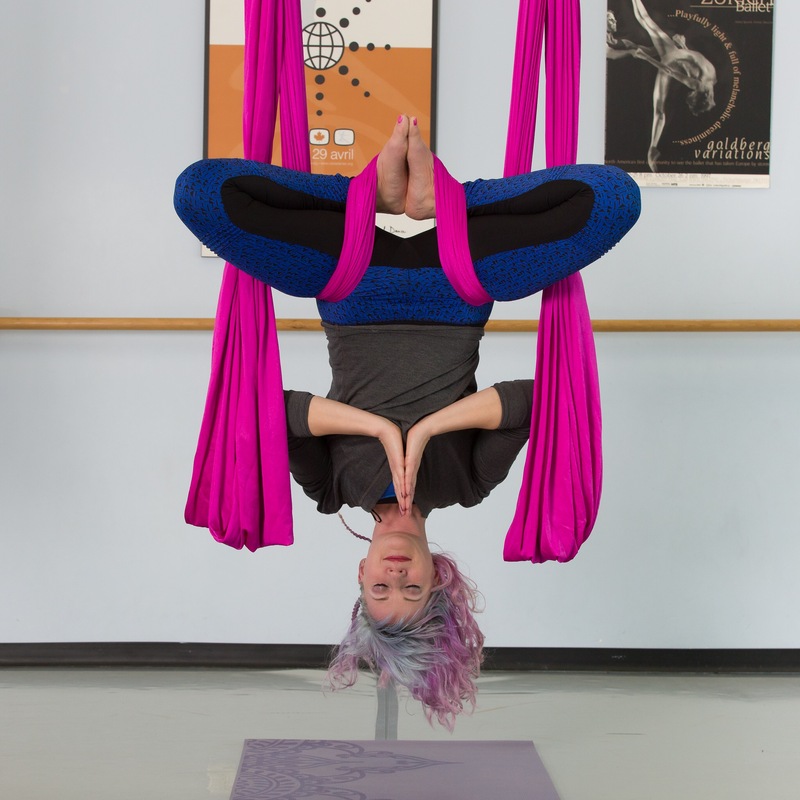 My quest for the creative and magical has since led me to aerial yoga. 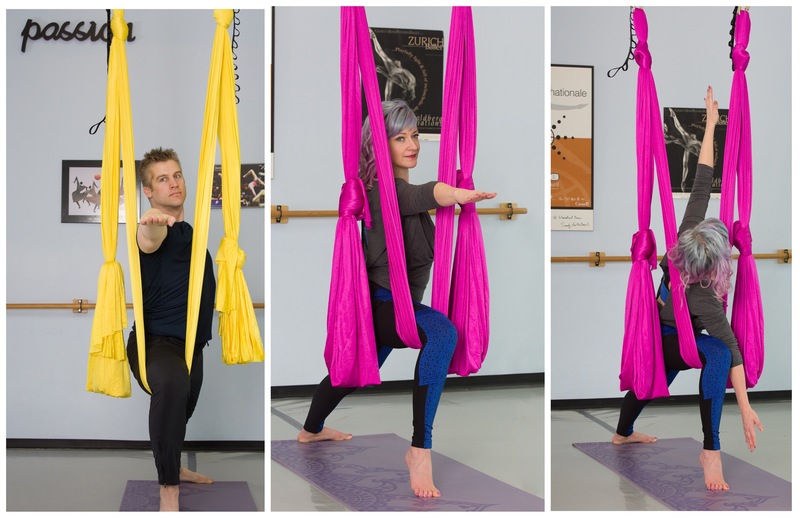 Maybe it’s laying in savasna inside of a gently swaying yoga hammock or the tactile feel of the silks but aerial yoga is a multi sensory experience unlike any other fitness class I’ve tried. 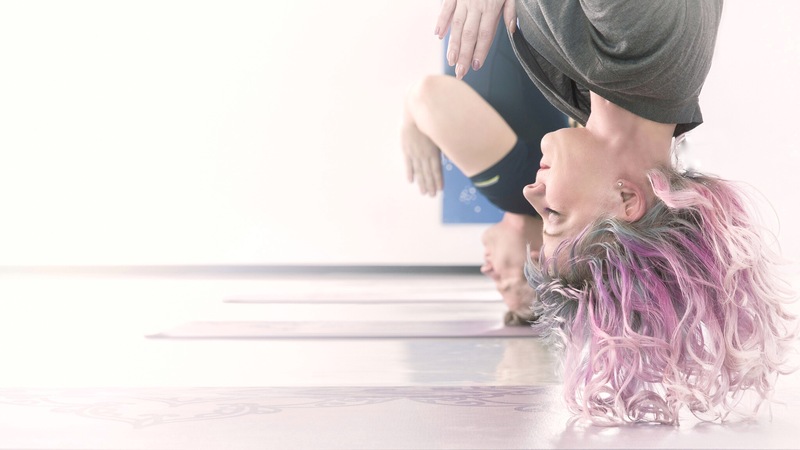 I discovered this unique yoga experience at Monica’s Danz Gym after I enrolled my daughter in an acro/aerial class several years ago. After watching the creative, physical fun she was having, I was excited to discover there was a way I could experience something similar without feeling intimidated by the high climbing aerial acrobatics I’ve watched in the past. 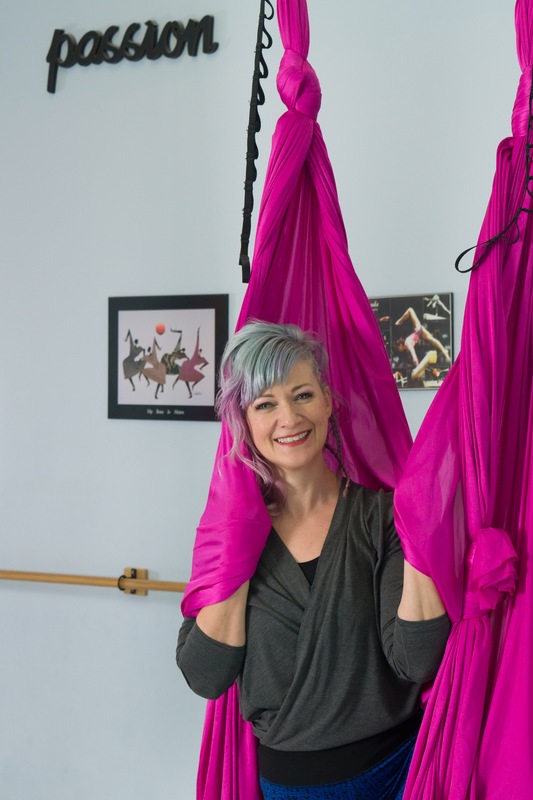 Monica Goermann, among her long list of amazing skills, is a certified aerial yoga instructor and provides safe and positive classes for all experience levels. 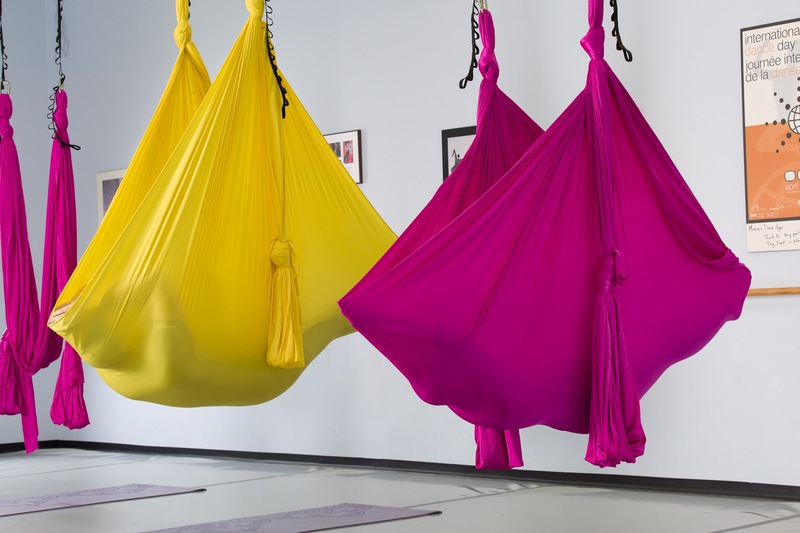 If you have yoga experience you will recognize many poses done in a unique way with the support of the hammock. 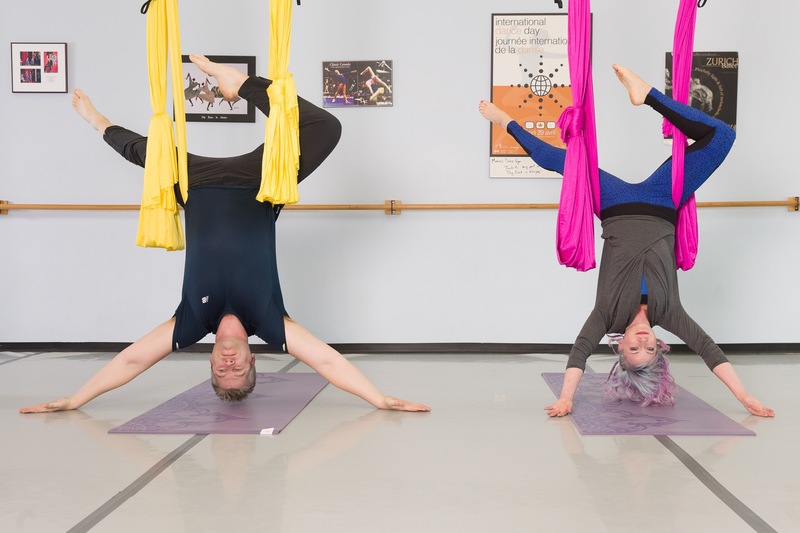 But even if you have no past experience with either yoga or aerial arts, this class is much simpler than it looks! And yes, it’ll hold you! Safety is taken seriously at Monica’s Danz Gym. There is truly nothing like hanging upside down! It’s for sure my favourite part and I will take every opportunity during a class to do so. There is a special kind of release you feel that is almost like gravity pulling you up instead of down. I get it now, when yogis post #InversionJunkie on Instagram. I joined that club. Inversions take a little getting used to but are very safe and supported by the aerial hammock. Monica is a great teacher who inspires confidence both in the technique and in yourself. 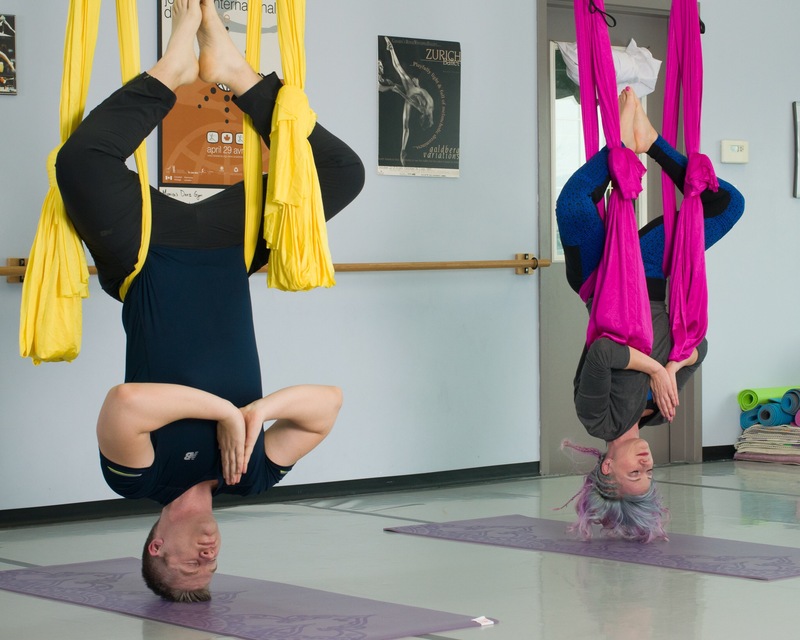 There is a childlike playfulness in aerial yoga that you don’t get in a regular class. With a bit of experience comes a freedom to explore the different postures so they best serve your body on any given day. Plus there is the simple joy of remembering what it was like to play on the monkey bars and swings as a kid. This class feels like my own personal playground that I get to visit every week! Classes until the end of June are Friday mornings at 9:30 and Sundays at 8:30 and 9:30. Wednesday evenings at 5:00 over the summer. 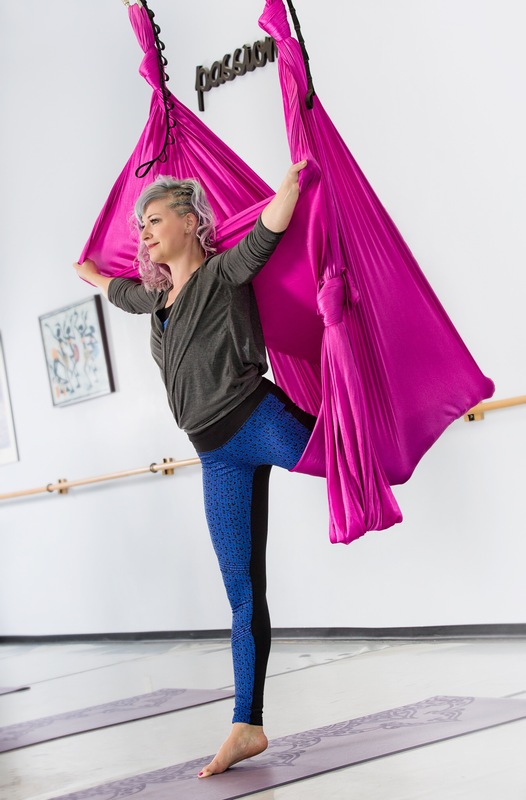 Now that I’ve been doing aerial yoga for a couple of years I am ready to explore the other circus arts taught at Monica’s some more. They are hosting several bootcamps this month for teens and adults! 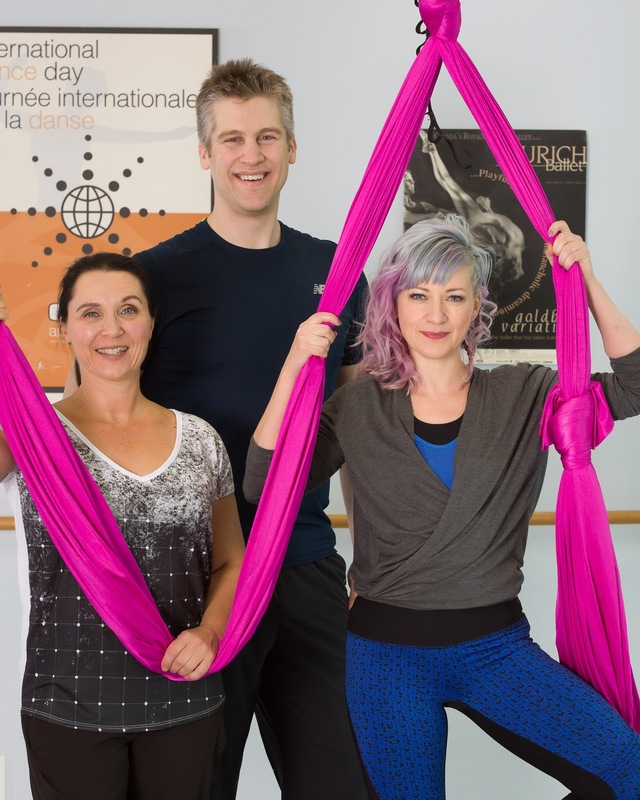 Three evenings a week gives you a great intro into aerial yoga, aerial silks and trapeze. Super challenges for your body, mind and soul! I also love that these happen after my kids activities have come to a close but not quite into the swing of summer yet. Clearly, Monica is a mother too. I did her boot camp last year and had a great experience! At $100 for one week and $225 for all three, that becomes a YES PLEASE! Send her an email here to get your registration in. Those kids who have kept us busy all year will just have to deal cuz its mom’s turn! In my world, I’ve come to realize that if I don’t crave the routine, it’s just not going to happen. My fitness journey has come down to finding ways to move that bring me joy. I knew at a pretty early age that my joy was not to be found on a volleyball court or ice rink so I’m thankful that life has introduced me to new experiences. Thank you to fitness expert Jordan Cieciwa for encouraging me to share my stories. He gives you access to all sorts of Winnipeg health and fitness facilities and blogs on winnipeg.onefitcity.com. Perhaps you can find yourself a new way to move that brings you joy! Huge thanks go to Flashbound Photography for the beautiful shots! Activewear apparel on Monica and myself by MPG Sport and on Jordan by New Balance.